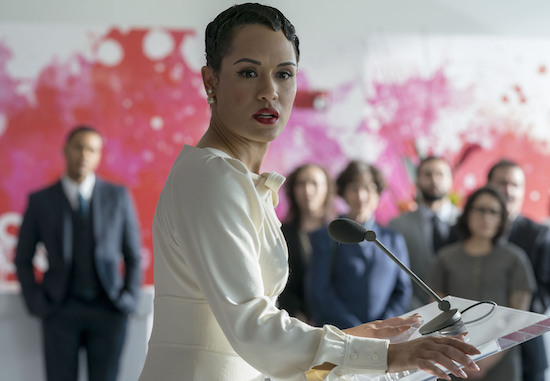 Former EMPIRE star Grace Byers (whose Aneka was killed in the season 4 finale) is staying in the Fox family. Byers has joined Marvel drama THE GIFTED as Reeva, “a smart, charming, authoritative, elegant, beautiful woman who is ruthless in her efforts to fight for her people,” the network teases. “She leads an elite band of followers and has a soft spot for her new recruits, but is still capable of extreme violence in defense of her vision.” Per Fox, Reeva will team up with Polaris (Emma Dumont), Andy (Percy Hynes White), and the Frost Sisters. THE GIFTED returns Tuesdays at 8/7c on Fox this fall.